To be recognised or approved, trainers will need to meet the standards as mapped against the seven areas. Educational Supervisors need to meet all seven standard areas, while Clinical supervisors should show evidence at appraisal that they have achieved and maintained competence in areas 1,2,3,4 and 7. Provision of teaching and supervision to juniors and colleagues requires the expansion of competencies that most doctors have innately or have acquired in training. The use of those competencies for training can be developed progressively – i.e. from the role of teacher, to mentor, Clinical Supervisor, Educational Supervisor, and finally Training Program Director – using external provider courses, e-learning and feedback informed practice. 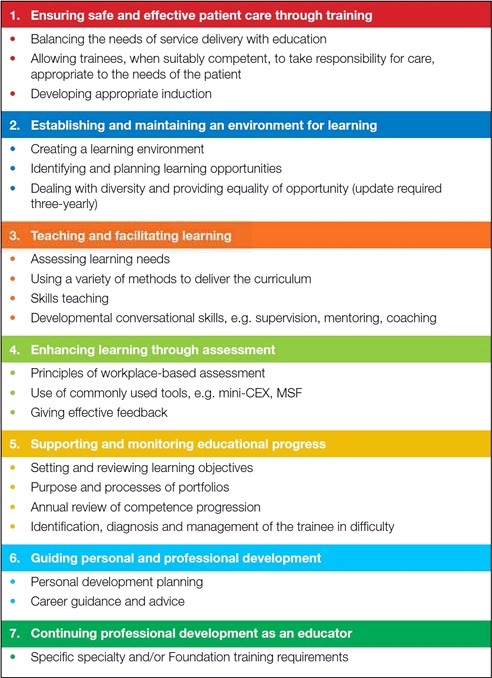 Competencies are mapped against the seven framework areas outlined above, will become part of normal appraised practice and should lead to approval and registration as an educator with the GMC via the Deanery. Training is a partnership between the supervisor and the supervisee. It requires the active involvement of both parties and within this partnership trainer and trainee both have responsibilities and obligations. Clinical supervision relates to day-to-day oversight of trainees in the workplace and is an activity that involves all clinicians who come into contact with trainees. Educational supervision relates to the oversight of trainees’ progress over time. Educational Supervisors are responsible for ensuring that trainees are making the necessary clinical and educational progress. Educational Supervisors will need all the skills of clinical supervision, plus an appreciation of supporting educational theory, the ability to undertake appraisal, work with portfolios and provide careers advice. Managing a trainee in difficulty will also involve the educational supervisor with support from training structures. Supervisors have access to training from a variety of sources e.g. Royal Colleges, FOM, e-learning. Regardless of how, when or where training is undertaken, the seven areas of the professional development framework for supervisors should be covered. Once undertaken, it is not necessary to repeat this training, although named Educational and Clinical Supervisors are expected to demonstrate an ongoing commitment to their development as a medical educator through participation in a three year cycle of review. All named Educational and Clinical Supervisors are expected to refresh their training in equal opportunities and diversity every three years. This guidance has been produced to assist current and developing educators to achieve and demonstrate compliance with the Academy of Medical Educators seven areas of professional development. 2. The success of these activities is to be measured by the individual and senior colleague (Ed Sup or TPD) and can be summarised for use in the annual medical appraisal. 3. To become a named Clinical or Educational Supervisor, initial training in the seven areas should be undertaken and evidence submitted to the local Deanery. 4. Summarise any relevant training (e.g. short courses, e-learning) undertaken in relation to your supervisory role and the professional development framework area(s) to which it relates. Training may relate to more than one area. Download a handy Microsoft Word version of this table. 5. At least once during a revalidation cycle, your appraisal should include a comprehensive review of your educator status. On other years, the appraisal of the teaching component of your practice can be appraised alongside the rest of your work. 6. 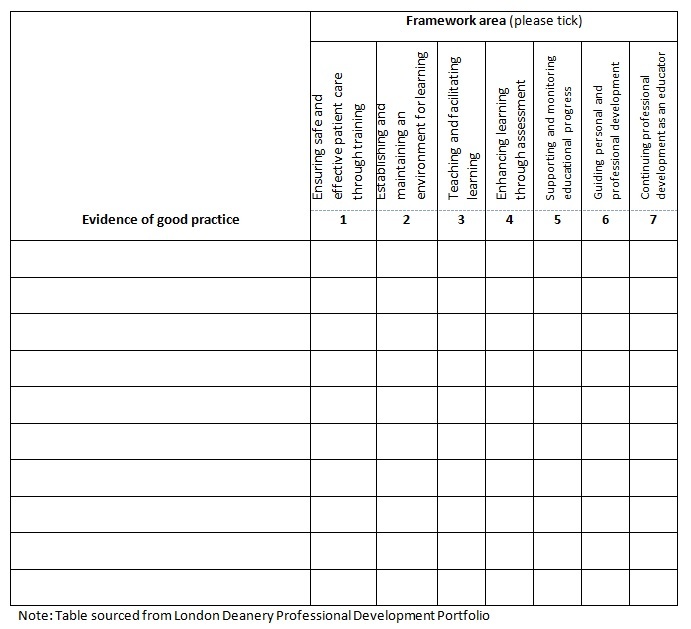 List the evidence of good practice that is being submitted and the Professional Development Framework area(s) to which it relates. Evidence must have been collected within the revalidation cycle or three years preceding the review (whichever is the longer) and where possible should include data from the latest GMC trainee survey or equivalent where available. Each piece of evidence may relate to more than one area. 7. CPD activities should cover at least two areas each year and over the revalidation cycle all seven areas must be covered.